The Birth of Swadesh - July 31, 1921. Gandhiji’s Ten Commandments - UK, 1928. Alley-Oop! - John Ford, Contributors‘ Club, 1930. 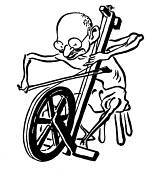 India - “Our weapons are different, Mr. Gandhi, but one of us must finally win.” - Simplicissimus, Munich, Germany, 1930. Putting Salt On His Tail - Sun, Baltimore, USA, 1930. The Shop That Was Heard ‘Round The World - Post-Dispatch, St. Louis, USA, 1930. Gandhi – Kladderadatsch, Berlin, Germany, c. 1930. 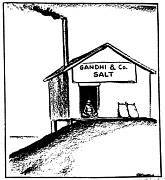 Gandhi Goes To “War” - Prager Presse, Prague, Czechoslovakia, 1930. 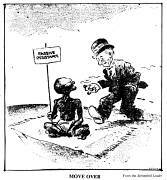 Move Over - Springfield Leader, USA, 1930. The British Lion Shows Its Claws – 1930. Hitting England In The Fatal Spot – Where The Cotton Is - Simplicissimus, Munich, Germany, 1930.